Five speakers from different pedagogical backgrounds talking about learning environments where knowledge is shared and generated. 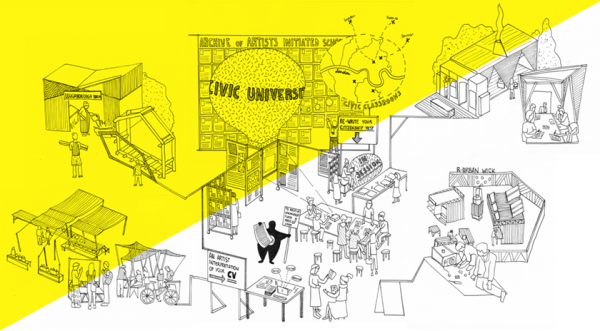 Introducing the Civic University specifically within the context of the schools we have so far found offering alternative education models and arenas of learning. Prof Robert Mull - Global Practice Programme. Prof Robert Mull led The Free Unit at the Sir John Cass School of Art, Architecture and Design since 2004 and is currently developing the Global Practice Programme with international educational, NGO and institutional partners including the Civic University. Robert will explore concepts of educational freedom and duty based on his recent work within the European refugee crisis. The Eco Nomadic School (since 2009) is a pan-European network for local knowledge production and trans-local knowledge exchange. Partners include amongst others atelier d’architecture autogerée (F), Myvillages (NL), Brave New Alps (IT) and APTNV (RO). The upcoming ‘'Learn to Act" publication (June 2017) documents and describes its ongoing but geographically dispersed structure of the school, local curricula and civic pedagogy, international set-up and knowledge sharing as an act of commoning. #DroneHackademy is a hacktivist temporary school and critical theory platform for the use of unmanned aerial vehicles as a social technology. The first edition occurred in Rio de Janeiro to support the struggle of Vila Autódromo, a local community alongside the Olympic Park that resisted eviction. An aerial cartography was produced to show real state violence by the local government and construction companies.